The Park Place car dealerships had their company picnic at the Southern Cross Ranch this past weekend. 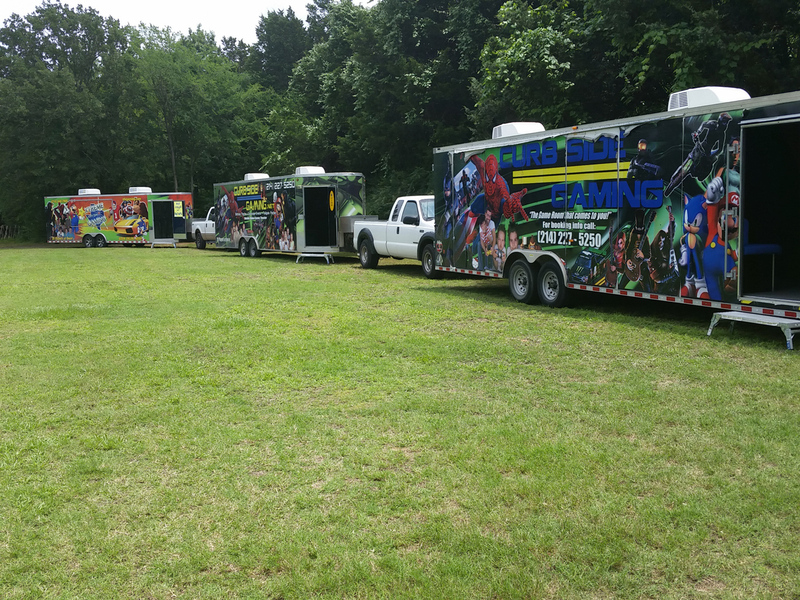 Because of the size of the event, NTX Gaming was requested to bring out all 3 of our gaming trailers. As you can see from the picture, we had them all line up with 15 consoles and 15 big screen TV’s for their gaming enjoyment. We set up at the far end of the softball field next to the carnival games. The ranch is a big place and there were several other activites going on. There were bounce houses, a pool, pig races, pony rides, a petting zoo and many other attractions. We heard the food was pretty good as well! 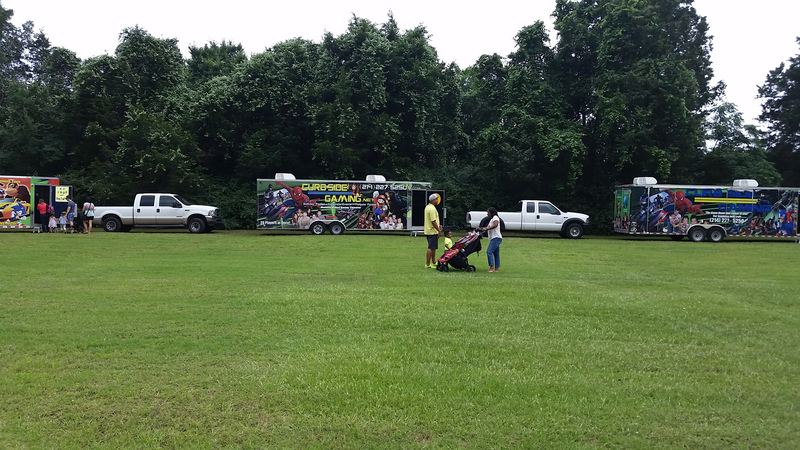 We had a steady stream of visitors and several went from trailer to trailer to play the different games. Mortal Kombat was a big hit along with the usual favorites, like Mario Kart 8, Super Smash Bros and Black Ops 3. We also had several sports games going. All in all, it was a great event and we were glad to be a part of it. We would love to be part of your corporate event. We have several coming up over the next month, so give us a call today to get on our calendar. 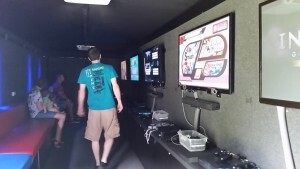 We are sure your guests will have a great time playing games in our air conditioned coaches. Don’t forget about our Laser Tag. 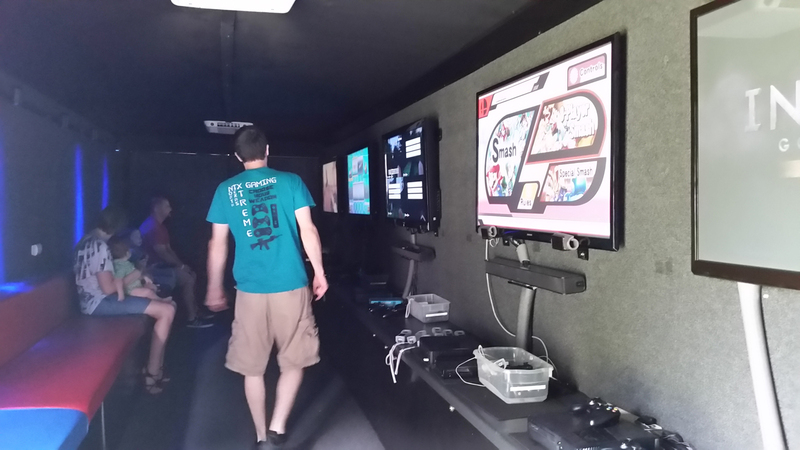 We have combo packages for the game truck and laser tag that will really make your event stand out. Thanks again to the Southern Cross Ranch for having us out. Check out the short video of the ranch. As one of the newest “Dude Ranches” in the Dallas Fort Worth Metroplex, The Southern Cross offers nearly 17,000 square feet of meeting and banquet space. With one hundred year old Oak trees towering in the background, The Southern Cross provides the perfect setting for any type of Company Picnic, Corporate Meeting, Team Building, Church Picnic, School or Class Reunions, as well as Wedding Receptions and Quinceaneras.